Is the honeymoon over for the Republican Party? Morning Consult/Politico polling trends suggest that may be the case. The 2016 election ushered in a unified Republican government and brought a newfound hope among business leaders and markets, while also stoking voter optimism for the future of the country. But as the Republican Party has struggled to implement its agenda in the first months of President Donald Trump’s tenure in office and market confidence has dissipated, so too have the positive feelings of voters. 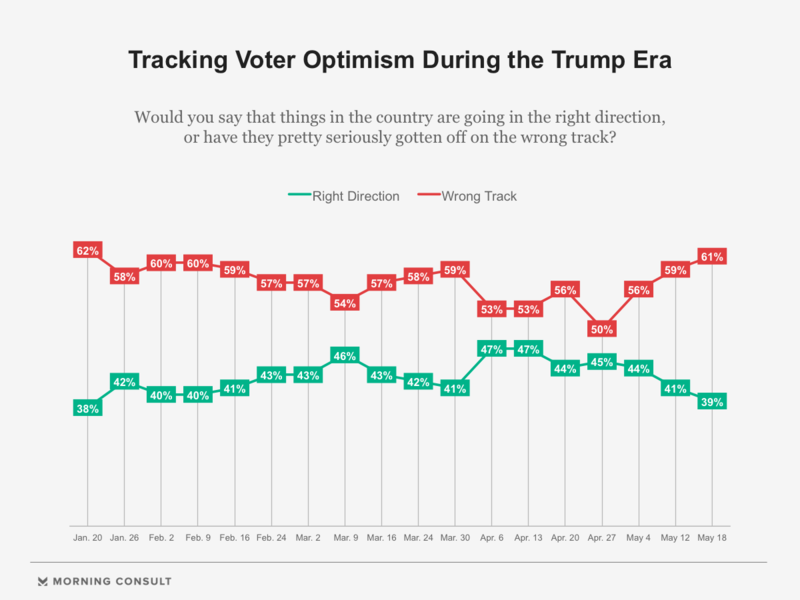 In the most recent Morning Consult survey, 39 percent of registered voters said they thought the United States was headed in the right direction, while 61 percent said it was on the wrong track. It’s the lowest indicator of voter optimism since President Donald Trump was inaugurated — when 38 percent said the country was on the right track, vs. 62 percent who disagreed — and it’s also down 8 points from the high point of the Trump presidency in early and mid-April, when almost half (47 percent) said the country was trending positively. The declining optimism from the April high-water mark was chiefly felt by independents and Republicans. While 42 percent of independents and 79 percent of Republicans said they were bullish in mid-April, that share was down to 31 percent and 69 percent, respectively, in the most recent poll. During the same time frame, optimism among Democrats dwindled 5 points, from 21 percent to 16 percent. Voters who prioritize the economy, health care and some longtime entitlement programs are also feeling more bearish over the past month. Almost half (47 percent) of voters who said the economy is the most important thing on their minds when casting their vote for office said they were optimistic about the country in April, but that figure fell to 38 percent. From mid-April to mid-May, there was also a 10-point drop among voters who prioritize health care (from 37 percent to 27 percent) and an 11-point drop among voters who think most about Medicare and Social Security (from 48 percent to 37 percent). It’s also been a stark drop in the past month among the voters who cast their ballot for Trump in November. While 83 percent of those voters said the country was headed in the right direction in mid-April, just 68 percent said the same in the most recent survey. If there is a silver lining for Trump and elected Republicans in Congress, it’s that while there may be declining goodwill among the base in the short term, it’s still a positive trend from the beginning of Trump’s presidency. During the first Morning Consult survey of the Trump tenure, taken over the weekend of his Jan. 20 inauguration, 55 percent of Republicans and 56 percent of Trump voters said the country was headed in the right direction. On the other hand, the declining share of optimism among Americans who voted for Democratic presidential nominee Hillary Clinton in 2016 serves as a warning sign ahead of the 2018 midterm elections, when base enthusiasm and turnout are integral in determining who holds the reins on Capitol Hill. Just 12 percent of voters who opted for Clinton last year said the country was headed in the right direction, compared with 23 percent who said the same in the days following Trump’s inauguration. The national, online Morning Consult surveys were conducted throughout 2017, each carrying a margin of error of plus or minus 2 percentage points.